These are permanent, engineered structures, in which dairy cattle are housed and provided with their daily dietary requirements and water. They may be open air, partially or fully enclosed. 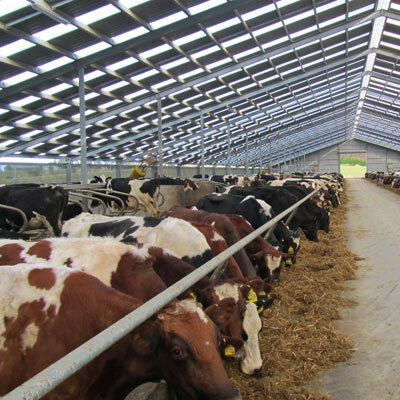 Freestalls are typically used to house dairy cattle for extended periods and include a bedding area for cattle to ruminate and rest. The term 'freestall' refers to the bedding area where cattle are provided cubicles (stalls), where they may lie down. Feed and cow alleys, as well as bedding areas are cleaned daily to maintain cow comfort, health and production performance. Internal or external loafing areas may also be included in the design to provide additional area for cattle to move around. Higher production cows may require milking more frequently than twice daily. Feed supply management plan needed on farm or off farm to ensure reliable feed supplies in to the future - do you have sufficient? Feed bunker area and machinery required to handle and supply a range of supplementary feed types to the herd. Cow production was a major motivator behind Jimmy's decision to build a barn. Read about his decision making process and advice to others in this case study. Jeff Gould was already running a high input system but feed wastage was high when feeding out onto pasture. Read about his key learnings and decision process in this case study.